Toronto, Ontario--(Newsfile Corp. - March 4, 2019) - Currie Rose Resources Inc. (TSXV: CUI) ("Currie Rose" or the "Company") is pleased to provide shareholders with an activities update on the Rossland Gold Project (the "Project") located in central southern British Columbia (Figure 1). Michael Griffiths, Currie's President and CEO, commented; "The Drone magnetic survey and the reprocessed VLF-EM have provided strong overlapping evidence of the potential for extension to the mineralisation mined early last century and we are very encouraged by these results as they provide greater confidence to our approach. "We are very pleased our vendor group has agreed to extend our first year exploration expenditure period to July 2019 and look forward to a long and fruitful partnership." A 25m spaced, 164.82 line km Drone Magnetic Survey (UAV-MAGTM) was flown by Pioneer Aerial Surveys Ltd. using an Unmanned Aerial Vehicle (UAV) covering the norther sector of the Project (Figure 2). 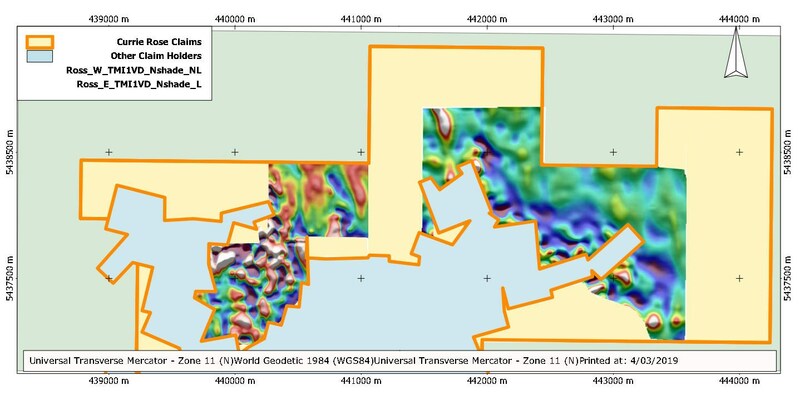 The survey was designed to cover two segments the northern half of the project area and additional processing of the data was completed by Southern Geosciences in Perth, Australia. 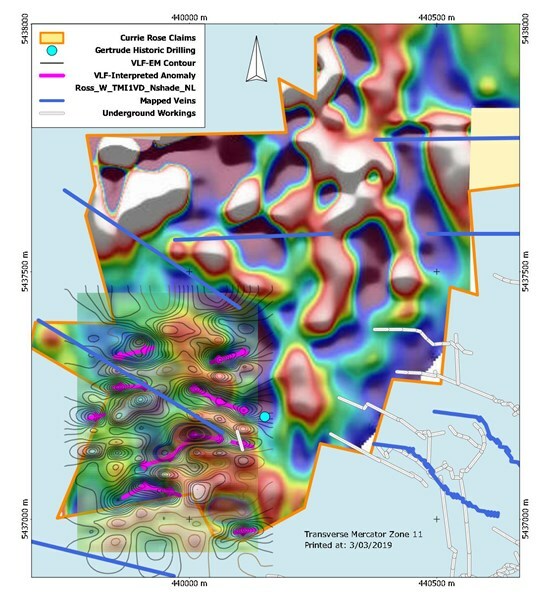 Historical geophysical surveys indicated that gold mineralisation within the Rossland Camp was often associated with iron sulphide (pyrrhotite) and that there was some opportunity to identify coincident surface mapped gold bearing veins with geophysical methods. 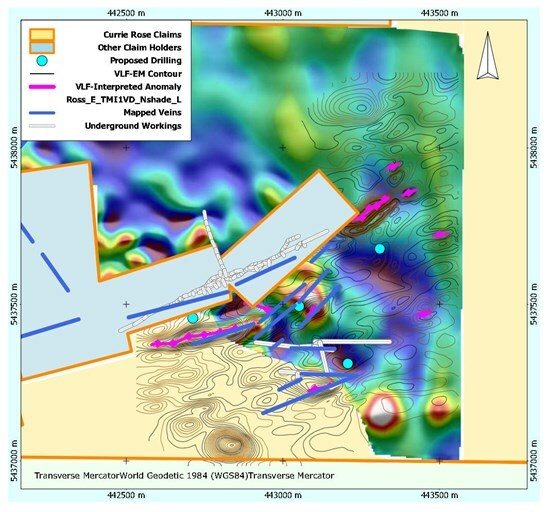 The recent survey has successfully identified a number of anomalies that coincide with surface mapping, historical drilling and the re-processed VLF-EM anomalies adding further confidence to planned first pass drilling. Data from previous explorers has been identified and has undergone reprocessing by Southern Geoscience, Perth, Australia. A VLF-EM receiver, EM 16, manufactured by Geonics Limited of Mississauga Ontario, was used for the VLF electromagnetic survey. This instrument is designed to measure the electromagnetic component of the very low frequency field (VLF-EM). The source of the primary field used was the U.S. navy submarine transmitter at Seattle, Washington which transmits at a frequency of 18.6 kHz. The VLF-EM raw field results were reduced for plotting by applying the Fraser filter method. The Gertrude data was extracted from Assessment Report 13527 lodged with the British Columbia Geological Survey 20 May, 2010 and was completed February 2010 with a total of 3.5 line km (Figure 3). The combined survey has a total of 12.8 line Km of data (Figure 4). 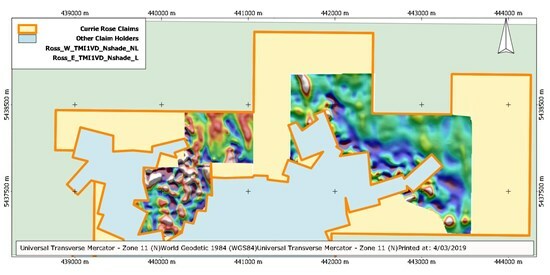 VLF-EM has been a very successful geophysical tool in the Rossland area and has identified strong, coincident anomalies to mapped surface expressions of the high grade gold veins extending from the historic Le Roi and War-Eagle veins that produced over 2.7mozs gold. The anomalies have been interpreted to reflect disseminated or semi-massive accumulations of sulphide minerals and these results have confirmed the Company's original interpretation and confirmed the potential for extensions to the mineralisation on claims previously mined. 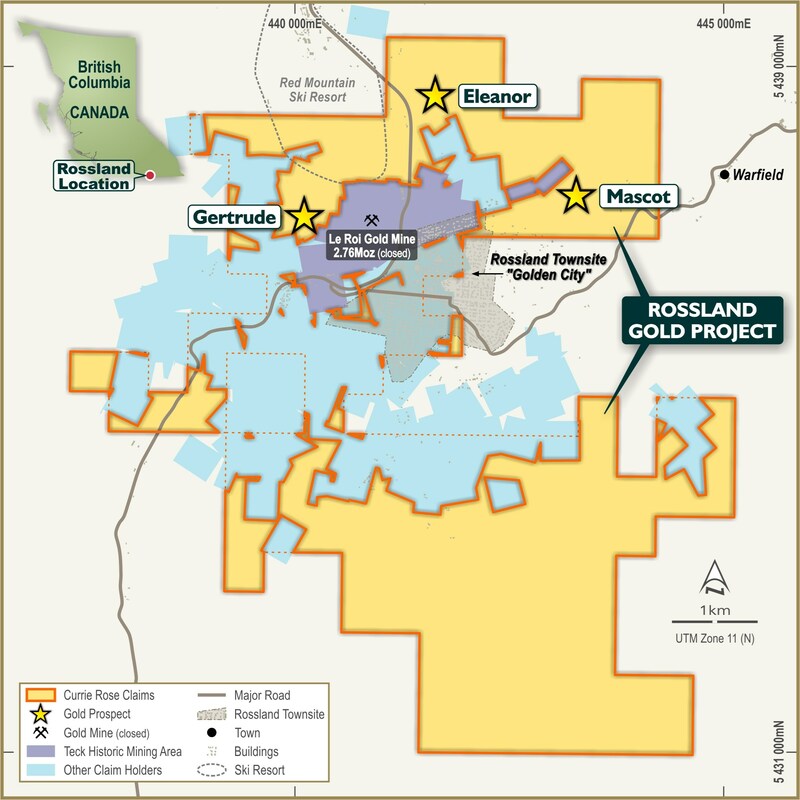 The Rossland Gold Project is situated 10km west from the Trail Zinc Smelter in south-central British Columbia. The Rossland Mining Camp produced more than 2.7 million ounces of gold, 3.5 million ounces of silver and 71 tonnes of copper between 1894 and 1941 and ranks as the third largest lode gold camp in British Columbia. About Currie Rose Resources Inc.
Currie Rose is a precious metal explorer focused on identifying high value assets in Canada. Our current projects span British Columbia and Ontario with our immediate focus on the Rossland Project in BC. All exploration on the project was supervised by Currie Rose Resources Inc ("Currie") CEO Michael Griffiths FAusIMM, who is the Qualified Person under NI 43-101. Currie applies industry standard exploration sampling methodologies and techniques. The Currie Rose scientific and technical information in this news release has been prepared in accordance with the Canadian regulatory requirements set out in National Instrument 43-101 (Standards of Disclosure for Mineral Projects) and reviewed and approved on behalf Currie Rose Resources by Michael Griffiths, FAusIMM, President & CEO for Currie Rose Resources, a Qualified Person. This news release may contain forward-looking statements that are based on the Company's expectations, estimates and projections regarding its business and the economic environment in which it operates. Statements about the closing of the transaction, expected terms of the transaction, the number of securities of Currie Rose that may be issued in connection with the transaction, and the parties' ability to satisfy closing conditions and receive necessary approvals are all forward-looking information. These statements are not guarantees of future performance and involve risks and uncertainties that are difficult to control or predict. Therefore, actual outcomes and results may differ materially from those expressed in these forward-looking statements and readers should not place undue reliance on such statements. Statements speak only as of the date on which they are made, and the Company undertakes no obligation to update them publicly to reflect new information or the occurrence of future events or circumstances, unless otherwise required to do so by law.